The book has been out for a while now, but when I made this leek soup recently I remembered Mireille Guiliano’s recipes for a cleansing, ‘magical’ leek soup from French women don’t get fat and thought it be a perfect time to mention her honest and witty guide to enjoying a love affair with food without paying the consequences. If you haven’t read it, I thoroughly recommend it. 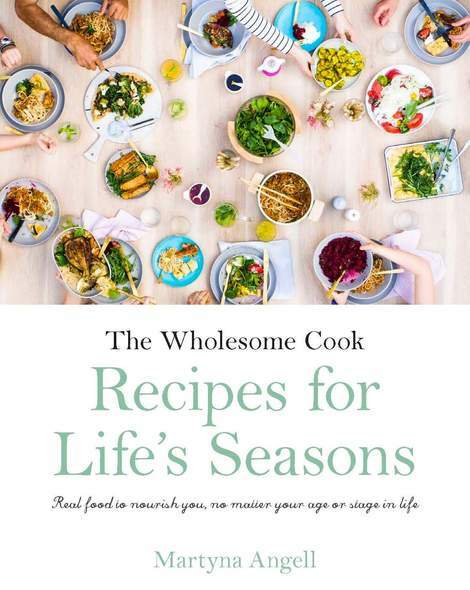 Having been through a rollercoaster of self-inflicted wardrobe changes from size 8 to 14 then back to 10, it was a breath of fresh air to come across a book and an author who takes a more common-sense approach to not so much dieting, but making lifestyle choices that bring pleasure back to weightloss and are sustainable for managing long term results. Many of us have now been conditioned to cringe when confronted with pleasure-bringing foods and age-old dinner staples such as bread, butter, wine and dessert, so Mireille may seem extreme to some as she explores the satisfaction of eating everything in reasonable moderation and the importance of finding one’s own gastronomic (and gastric) balance for weightloss, but I think she is right! Actually, I know she is because at one point in my life I managed to put on 20 kilos within 12 months without even noticing… I’m slightly embarrassed to admit this, but back in those days I used to enjoy having a three course meal, or a whole pizza and then some, all to myself all the time. I went from weighing 60kg to bordering on 80. My love of food and inability to choose between real pleasure and habitual overeating was making me fat and I knew I had to do something about it as I felt very uncomfortable in my new, slightly more padded, skin. I didn’t have her book then, but I set some common-sense rules around my eating habits and portion sizes and within 6 months I was back to mid 60s.This was 5 years ago and that’s how much I weigh today, while happily enjoying all the foods I love without any drastic compromises. It was not a fad diet like so many advertised nowadays, it wasn’t about pills or supplements, or starving ymyself, or drinking some new-age jungle juice. It took some time and real determination because it was about changing habits for life. Sure, everyone is different and certain things work better for some than others, but that’s what’s so great about this common sense approach to enjoying food: find your own personal balance, based on your likes and dislikes. It will not only mean that you won’t have to deny yourself any of your favourite foods or treats, but you will also have a positive and a sustainable plan for the future. For now though, while I’m still learning to say no when there is food in front of me, I try to keep in mind the notion that sometimess less is more, so I savour each bite for longer. Food for thought. There is also the French women don’t get fat Cookbook for the more adventurous cooks. Adapted from Mireille Guiliano’s French women don’t get fat. Serve with (Cheesy) sourdough toast if you’re feeling adventurous, or afraid the soup might not satisfy you, though I’m pretty sure it will. Feel free to substitute mushrooms for cauliflower or iceberg lettuce leaves. You can also add other root vegetables to the mix. Frozen veges are great too. Slice leek. Heat butter or spread in a large saucepan, add leek and cook until translucent. Add mushrooms, carrot and berans stir fry for a minute. Cover with stock and cook for 20 minutes on a medium simmer. Serve with a crusty baguette or some sourdough. You’ve highlighted some wise truths in this post. Maybe tomorrow, once your tummy has recovered a bit 🙂 Or even tonight! What a great & personal post. I tend to put on weight quite easily and have gone a bit bonkers eating anything I want now that I blog about food. I’m nearly 40kgs lighter than I used to be, but I’m still well padded (helps me not hurt myself if I fall down)! I haev started swimming tho just to help with fitness and balance out some of the eating. I can’t wait to try some of the modifications you made of the French woman’s leek soup. Frozen veg is such a smart idea for adding extra nutrients (and making it more filling)! It is just the weather for soup. That one looks so healthy and nourishing, so perfect for the weather right now. Great post! Spot on, I completely agree with your and Mireille’s view on food. Love her book. I didn’t know there was a cookbook though! I’m currently running a giveaway (open to aussies) on my blog to win a copy of bestseller: “French Women Don’t Get Fat”. The book is NOT about DIETING, but eating for pleasure and making the right choices. It’s what French paradox is all about, isn’t it? 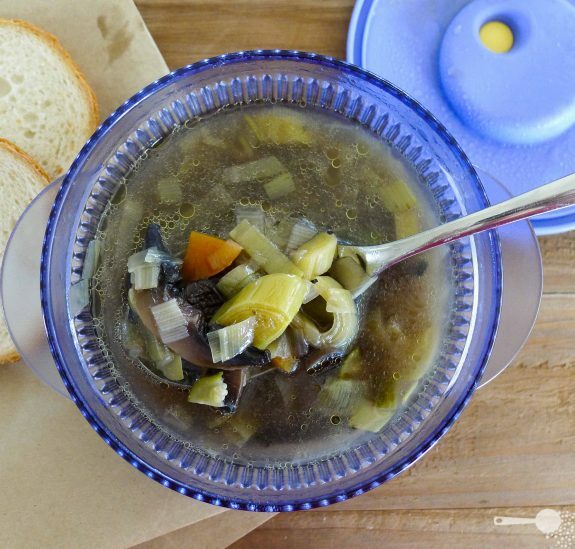 (ok the French leek soup doesn’t look that yummy…mais bon! Anyway, not sure if you have read this book already or are interested but feel free to visit me for a chance to win!